Biting The Hand That Feeds You: Leftovers for Valentines: Heart-Shaped Mini Sliders and Pizza Bites - Valentines Blog Hop! 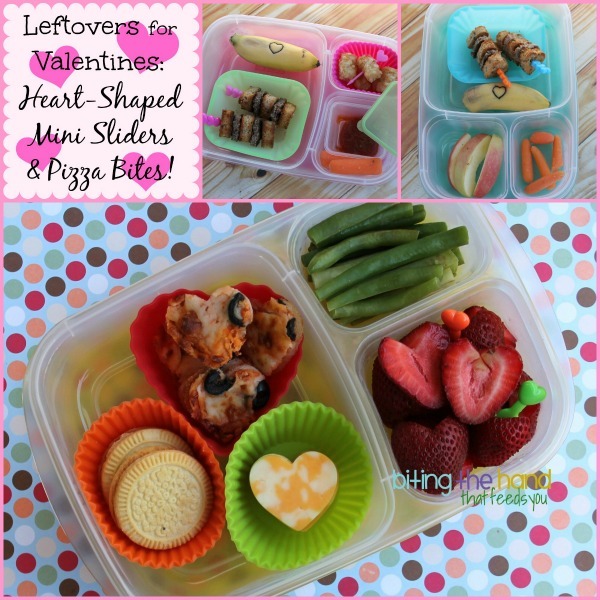 Leftovers for Valentines: Heart-Shaped Mini Sliders and Pizza Bites - Valentines Blog Hop! 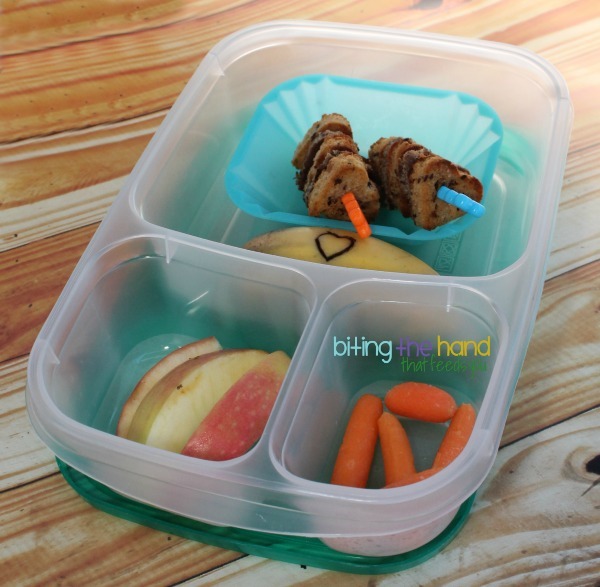 To celebrate Valentine's Day, Bento Bloggers and Friends is doing some heart-y blog hops! 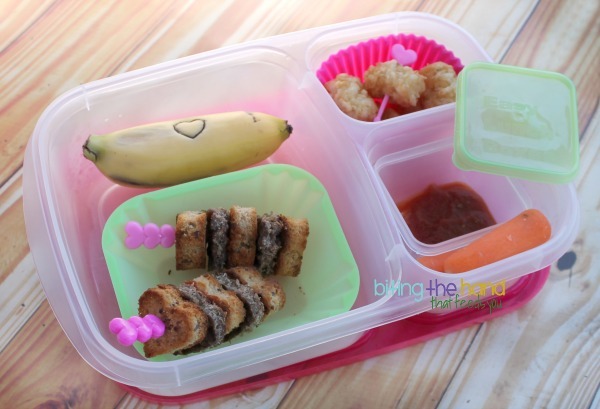 Click the button below to see what amazingly love-ly lunch Bento Monsters has created! But first, check out my lunches! I used a mini heart cutter on some leftover pizza and some Colby Jack cheese for Z. She loves Pizza Bites! To keep with the heart theme, I added some heart fork picks to the strawberries, which are also cut into heart shapes. Since most places don't offer gluten-free buns, and I hate paying the upcharge for a gluten-free bun that no one's going to eat anyway. And there aren't a ton of other gluten-free options in the kids menus at various restaurants. So I often have leftover hamburger patties with just a bite or two eaten. Since the girls tend to fill up on french fries. To make the leftover hamburger patties interesting (and palatable!) I used a mini heart cutter to cut as many hearts as I could, then cut some more out of gluten-free bread. I toasted the bread in the oven (on Broil, a few minutes on each side - watch them carefully!) and sprinkled a little garlic salt on them. Then I alternated them onto long heart picks, after spreading a little ketchup on each hamburger bite. I put some organic ketchup in a Mini Dipper to dip the sliders in, as well as the leftover tater tots. And I added a single heart pick in with the tots. Since banana peels brown when you break the skin, cutting in designs is a fun way to jazz up a lunch. I used a tiny heart cutter to make an image in the peel the night before, and it had browned nicely by morning. They also brown by lunchtime, if you pack in the mornings. 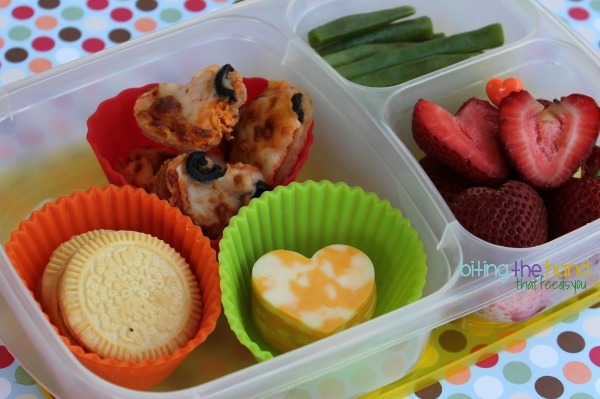 Cute lunches, I love the heart pizza bites! Love all of the cute mini food in the shape of hearts. Now I am hungry for pizza! Your pictures are fabulous! Great post! Love all the hearts, and that banana is adorable! Love the use of leftovers :). Love the reuse of leftovers they look awesome! 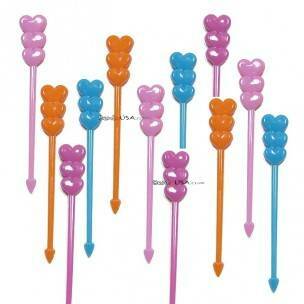 Those mini heart sliders on a stick are killing me! LOVE it! I love the heart toast on sticks! Seriously? Mini anything is so stinkin' cute, especially when packed for your own little 'mini' person! Love the lunches! Love the mini heart pizza!! What a creative way in using the leftovers! Love the idea of the cutter in the banana's!